Woburn, MA: Massachusetts brewery Lord Hobo Brewing Co. today announced distribution in Florida. 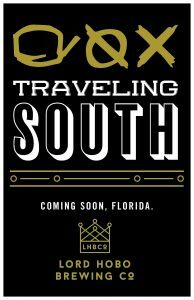 The brewery will enter the Florida market through Cavalier Distributing, beginning with a launch event in Fort Lauderdale on July 29, followed by a series of events around Tampa/St. Pete and Orlando during the first week of August. Lord Hobo is known for its three varieties of IPA, including its flagship Boomsauce IPA, Hobo Life Session IPA, and Consolation Prize Imperial IPA, which will be available on draft and in cans through the distribution agreement, according to a statement by Cavalier Distributing. The brewery, founded in 2015, is on target for 30,000 barrels in 2017. For a list of the launch event dates and times around Fort Lauderdale (July 29), Tampa/St. Pete (August 2-5, and August 12) and Orlando (August 2-4), see the announcement.